Only ten Stratoliners were built. Three Stratoliners were built for Pan Am; five served with TWA, and a ninth Stratoliner was supplied to Howard Hughes. The prototype Boeing 307, NX 19901 crashed during a test flight. 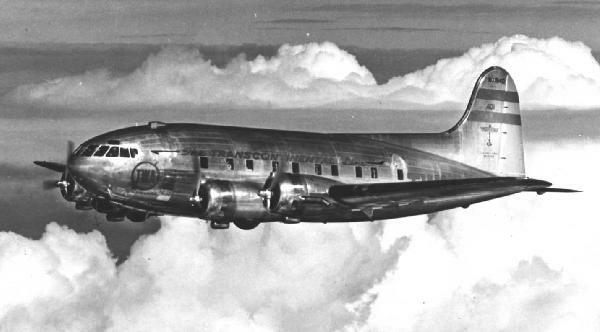 The Boeing Model 307 Stratoliner was the first fully pressurized airliner to enter service anywhere in the world. Being able to fly 20,000 feet higher than the 5,000 to 10,000 foot-altitude unpressurized airplanes a that time, it was said that it could "fly above the weather." It carried five crew members and 33 passengers and had a nearly 12-foot wide cabin for overnight berths. The Stratoliner was also the first land-based airplane to have a flight engineer as a member of the crew. Boeing's Model 299, prototype for the military bomber aircraft, which duly became the B-17 Flying Fortress, was developed in parallel with a civil version of the same aircraft, which had the company designation Boeing Model 300. The Model 307, or Stratoliner, was a straight forward conversion from the supremely successful B-17 Flying Fortress bomber. It employed the wings and tail surfaces of the B-17C Flying Fortress. The Boeing 307 was developed to start another era, that of pressurized comfort at higher altitudes than had been previously contemplated. The aircraft was the result of considerable research in high altitude flying by "Tommy" Tomlinson, of TWA, who was estimated to have flown more hours above 30,000 feet, than all other pilots combined. With his recommendations, Boeing produced an airliner which could cruise at 14,000 feet. The Boeing 307 first flew on December 31, 1938, and TWA put it into service on the transcontinental route on 8 July 1940, reducing the time to 13 hrs. 40 min., and cutting two hours off the DC-3's time. Three (S-307) Stratoliners flew on Pan Am's South American routes; five (SA-307B) served with TWA, and a ninth (SB-307B) Stratoliner was supplied to Howard Hughes. One Boeing 307 (prototype NX 19901) crashed on March 18, 1939 during a test flight. Each aircraft cost $315,000 in 1937 when ordered. The Flying Cloud, after its six year restoration by volunteer Boeing retirees. During World War II, Stratoliners were employed as C-75 military transports, flying principally to South America and across the Atlantic. In 1951 the ex-TWA machines, replaced the four 900 hp (671 kW) Wright GR-1820 Cyclone radial piston engines, with Wright Cyclone 1,200 hp (894 kW) engines. The wings were replaced with B-17G wings. They were then sold to Aigle Azur in France, operating to French IndoChina. Here they became involved with the Vietnam War, worked with operators such as Air Laos and were still flying into the 1970s. One example survives, The Flying Cloud, and is owned by the National Air and Space Museum of the Smithsonian Institution. After a six year restoration by volunteer Boeing retirees, it was rolled out of the hangar on June 23,2001. Unfortunately, the plane was almost lost, when during a test flight, it ran out of fuel and ditched into Elliot Bay, just west of downtown Seattle. Luckily, the airplane did not suffer severe damage and it was recovered and repaired again. It is currently on display at the museum's Steven F. Udvar-Hazy Center, at Washington/Dulles International Airport. The Boeing 307 Stratoliner cockpit. Four 900 hp (671 kW) Wright GR-1820 Cyclone radial piston engines. Created November 27, 2001. Updated October 13, 2013.